Guru...we have pictures of stone patio. In the picture album, under other pets...Ron posted my patio pictures. You can see them sinking, and unfortunately you can't see the grade. Our plan is to redo the stairs, take them out and close in the gap...making it one solid wall. A new grade and relay all the stones. I like the design! I like the circle design too. 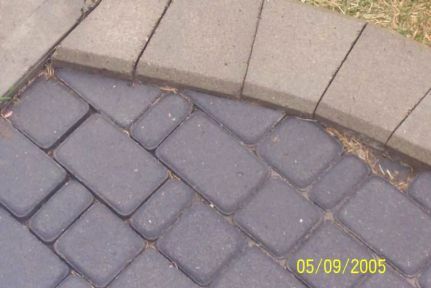 I see how the pavers are setteling. Too bad. talk to a person who does that local to you and see if it can be repaired... Unless you have your heart set on the change! Do you think the wall will come apart so you can use the stones over? 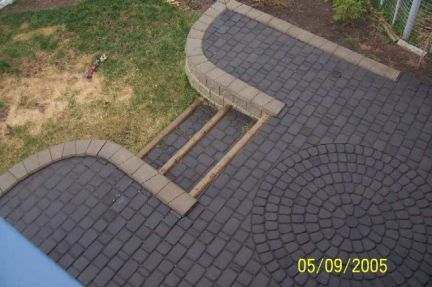 That would be great to have all the wall materials.. You will need more pavers though. Are they still available where purchased before, so the new ones will be at least the same design/size? The color of the new ones may be slightly different due to different dye lots and weathering, so have the contractor mix the old with the new randomly so they will blend in or make a border or design using only the new ones!! Good point, I didn't even think about the new stones, I'll have them mix it up. Thanks for the tip. 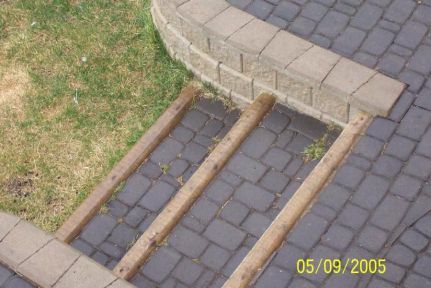 As for stairs, by the sidewalk it goes to grass, and hill. I've placed stepping stones. I might see if we have any left overs to put stirs on the corner as well. I use the stairs all the time to open our gate. But the dogs go pee as asoon as they touch the grass there, it has the most burn marks. Tried to teach them to go in one area, I gave up. Tonight we have a guy coming to check it out. I hope he can tell what/how the caps are put on. I sure hope we can do this with very little damage. I think we should have enough allan block to redo the design. 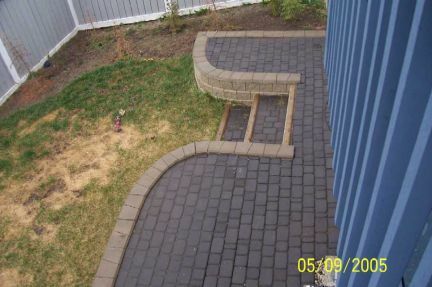 Dirt and rocks isn't too bad, and it's not alot of extra pavers...it will come down to labor costs.